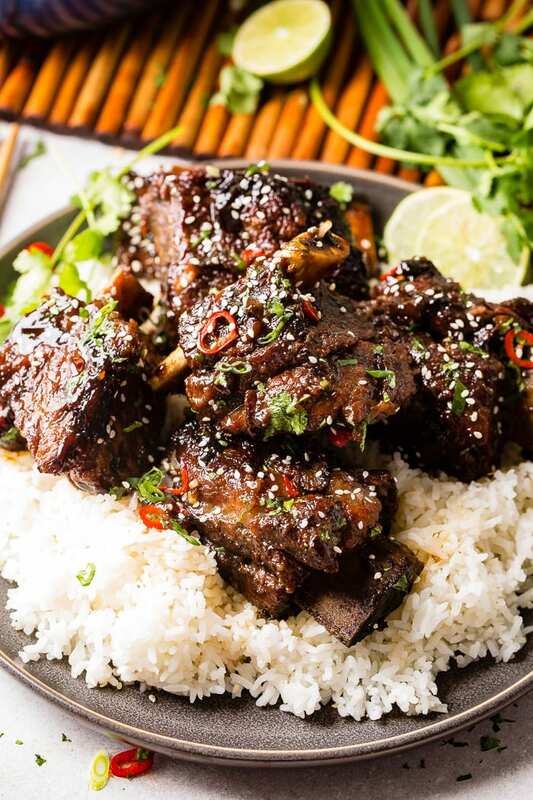 We cannot wait to share this Korean Oven Braised Short Ribs recipe with you! It’s a saucy, tender, flavorful twist on our Oven Braised Short Ribs! Remember how I said it was my favorite recipe of all time? Well it still is, but this Korean inspired version is just as delicious. The short ribs melt in your mouth and the flavors make you want to party like it’s 1999. Wait, that was already 20 years ago. 20! Mind blown! Ok, back to these short ribs! Where do we even start?! 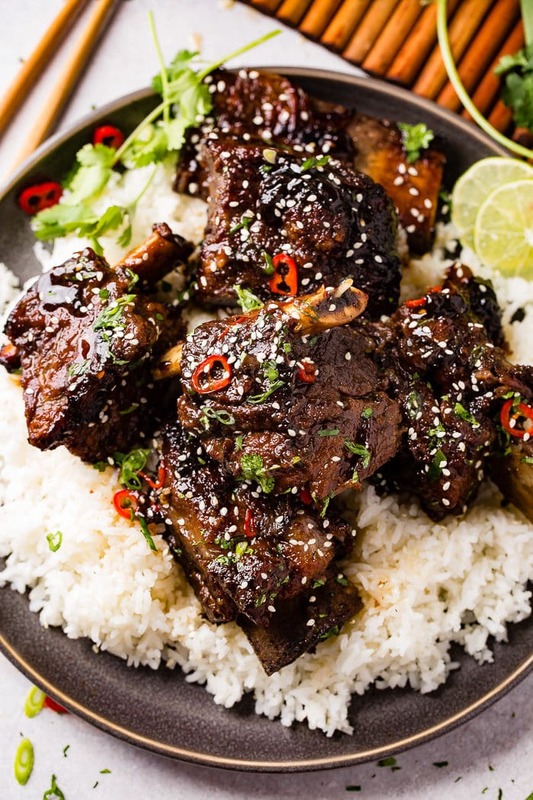 This recipe for Korean Oven Braised Short Ribs is even more wildly delicious than it looks! They look like you’ve slaved away in the kitchen for hours and days, but they are so easy! They practically cook themselves! 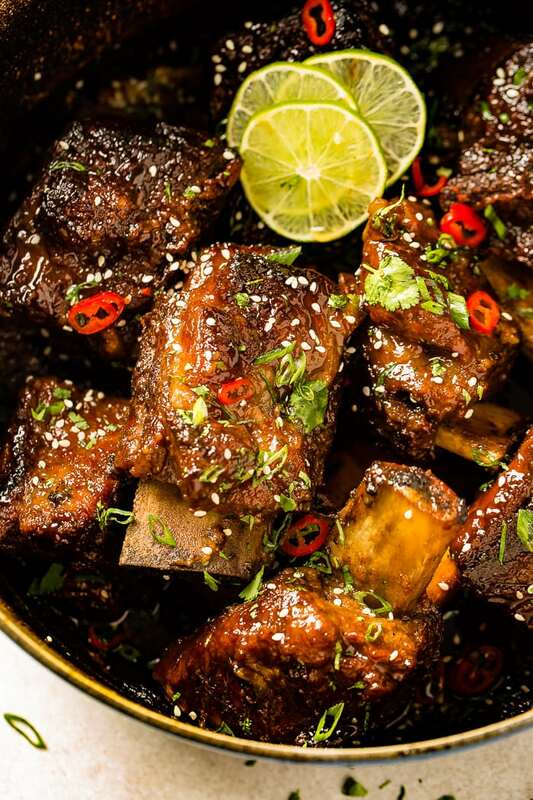 The key ingredient in this, besides the short ribs themselves, is gochujang. It is a backbone of Korean cooking and has the most incredible flavor! It makes the ribs a little sweet and a little spicy and whole lot delicious! Gochujang is a red chili paste that also contains glutinous rice, fermented soybeans, salt, and occasionally sweeteners. It’s thick and sticky and can be quite spicy and very concentrated and pungent in flavor. Is Gochujang spicy? I am a big wimp when it comes to spiciness, so I usually get a pretty mild variety. The heat can vary depending on what brand you buy, so check the label for the heat indicator. We like this one. Where do you buy gochujang? You can find gochujang at any grocery store. It will be in the Asian food section near the soy sauce and teriyaki sauce. You can also get it on Amazon. We also love the addition of lime zest and juice in this! 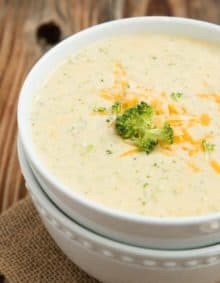 It gives it a fresh pop of flavor that is subtle but fabulous! Then of course you have all the garnishes that make it Asian inspired like sesame seeds, red chili pepper, and green onions. Braising…it sounds so complicated and professional, but really, there’s nothing to it! It is a combination-cooking method that uses both wet and dry heat. Generally, the food is first sautéed or seared at a high temperature, and then finished in a covered pot at a lower temperature while sitting in liquid. For these short ribs, we dredge them flour, salt and pepper, and then brown them all sides in a dutch oven. After sauteing some garlic and ginger, the liquids are added to the dutch oven and it all goes into oven to braise. Short ribs are a cut of beef similar to the spare rib in pork. Short ribs are meatier and thicker than spare ribs. The name “short rib” comes from the fact that the cut of meat contains only a portion of each long beef rib. You can purchase short ribs bone-in or boneless, but we prefer bone-in for this dish. Leaving that bone in adds so much flavor, and when the meat falls off the bones, you know you are in for a real treat! Now I’m drooling! These Korean Oven Braised Short Ribs are so hearty that you almost don’t need anything else, but a side dish or two is always nice. We like to keep it simple and just saute up some snap peas or steam some broccoli. 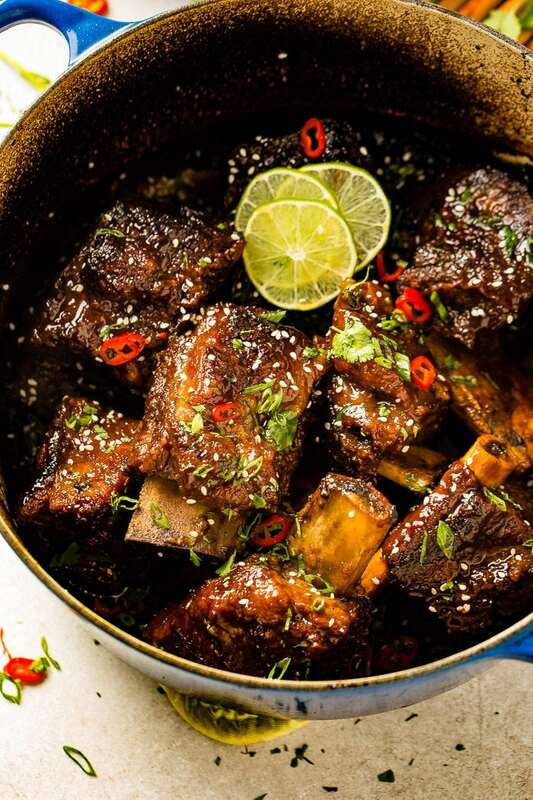 If you have company over, you will blow their mind with these short ribs! The gravy created by the braising process is so decadent! I could drink the stuff really, but that would be a little weird. We love the short ribs and gravy over jasmine rice. Back dinner up with these caramel brownies from scratch and everyone will be licking their plates clean! Then you can party like it’s 2019, because 2019 is even more awesome than 1999! 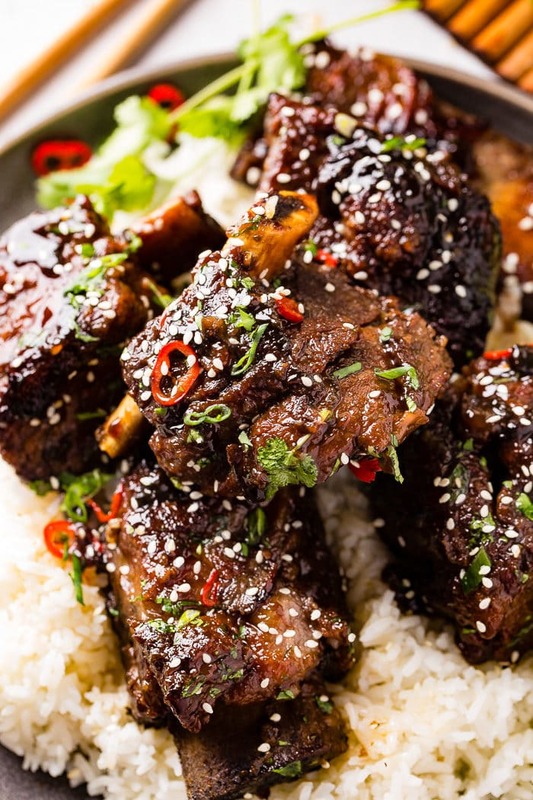 We cannot wait to share this Korean Oven Braised Short Ribs recipe with you! It's a saucy, tender, flavorful twist on our Oven Braised Short Ribs! Heat a dutch oven (this is our absolute favorite) or oven safe pot over medium high heat with a few drizzles of olive oil. Add 3-4 ribs at a time, browning on each side and remove to a plate. Prepare the measurements of the ingredients in a glass measuring cup except the garlic and ginger. Add a drizzle of oil if the pan is dry, tilting to coat the pan. Sauté the garlic and ginger over medium heat, stirring often. Quickly add the liquids into the pot, scraping the browned bits up off of the bottom of the pan using a wooden spoon. Return the ribs to the pot and reheat to a boil. Place the lid on the dutch oven and carry it to the oven, arranging it on the very center rack. Cook the ribs with the lid on for 2 1/2 hours, checking the meat to be sure it is tender and there is enough liquid at this point. If the meat is not tender, return to the oven for another 20-40 minutes. We've never had to do this, but if you do, just keep an eye on it. Carefully take the pot out of the oven and spoon liquids over the ribs. 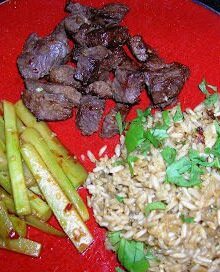 Top with garnishes and serve over Jasmine Rice. Looking for more Asian inspired recipes? 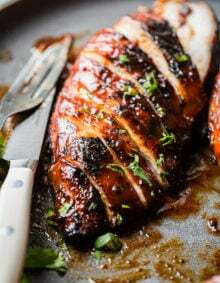 Try our Healthy Thai Peanut Steak Salad, Asian Ginger Marinade for Grilled Chicken, Asian Sticky Salmon, Easy Orange Chicken, Thai Peanut Sauce Noodles and Chicken, Sweet and Sour Meatballs, Sticky Asian Grilled Chicken Breasts, or Asian Sticky Slow Cooker Ribs. 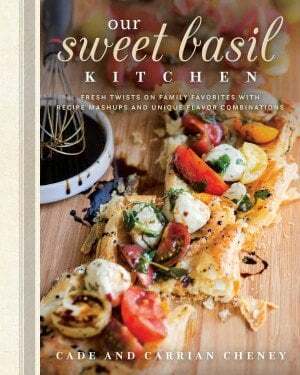 My best friend adores Korean food – I am so excited to make this for her! She will love it 🙂 As will I! That is so kind of you to think of her! 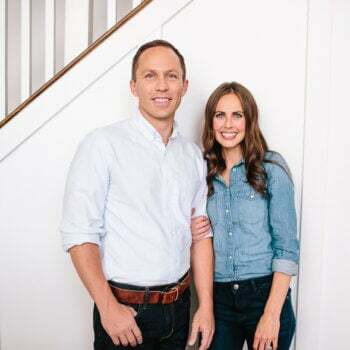 Hope you both love it as much as we do!